Peach Slab Pie is the BEST! No kidding, this pie will knock your socks off. 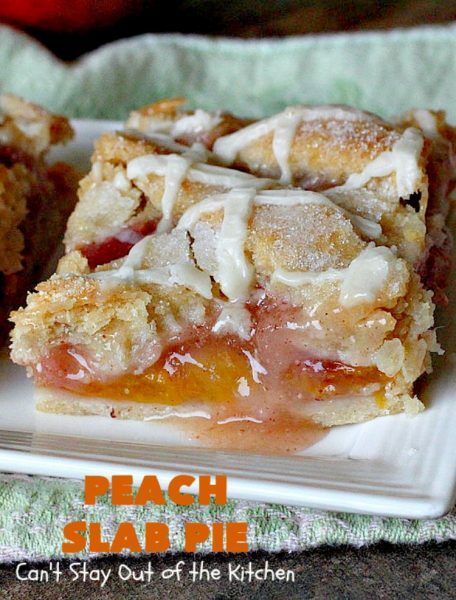 The recipe is actually a knock-off from my Double Crust Peach Cobbler recipe. It starts with three batches of Homemade Pie Crust. That’s equivalent to three pies with bottom and top crusts. 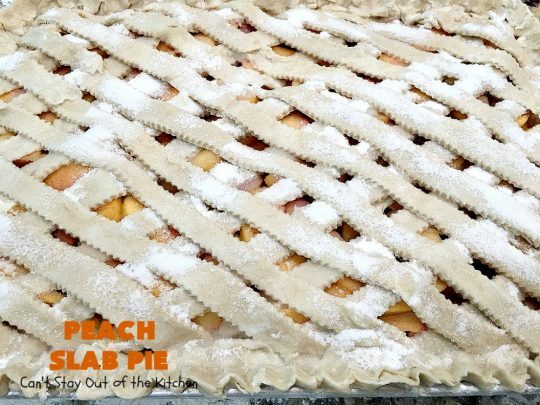 I use the filling ingredients from the Peach Cobbler and top it with a lattice crust. After baking, I drizzled a simple powdered sugar icing over top. Yum-O! My husband recently had surgery. It was extensive and took almost six hours. 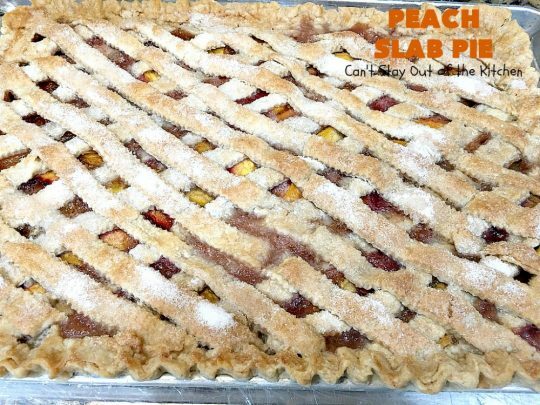 I sent Peach Slab Pie in with him when he went back to the doctor’s office for a check up. We dropped off the whole pan and they were delighted to get it. Since it is part of a teaching hospital, there are tons of employees that work in that department. When John went back a week later to pick up the cookie sheet, his doctor’s head nurse said everyone who tried it absolutely loved this pie. Listen, I only had a smidgen, but I could have wolfed down the whole pan it was so good. 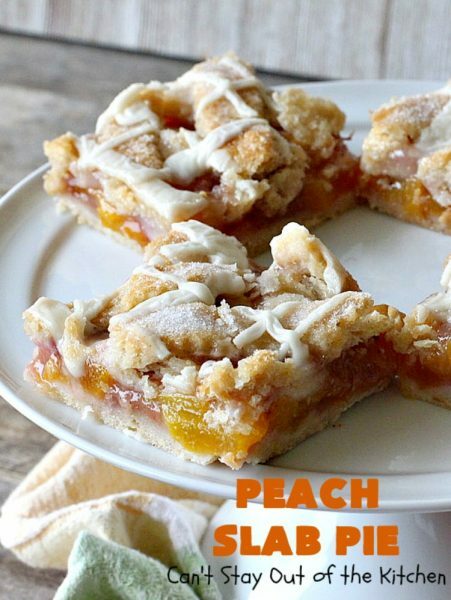 I love peach desserts anyway, but this one was really special. Because it was so big, I had to let it cook awhile before the peaches cooked up fully. 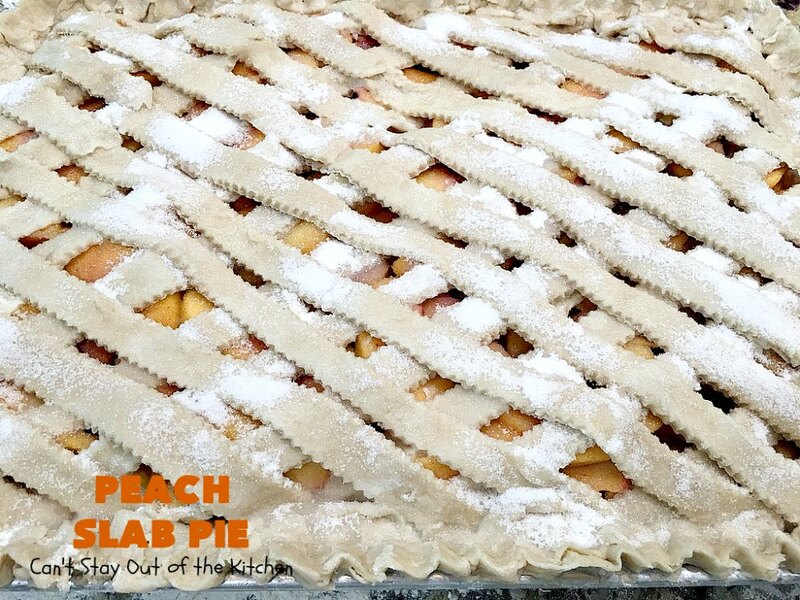 The goal is to allow the peach juice to thicken enough that the bars aren’t soupy when you cut into it. Most ovens will need a minimum of one and a half hours. I cooked my slab pie for ten minutes at 400 degrees. Then an additional 1 hour and 40 minutes at 350. (My oven does tend to run slow). The syrup was bubbling up between the lattice crust nice and thick the way it’s supposed to. Back in August, the Washington State Fruit Commission sent me a free twenty-pound box of peaches. 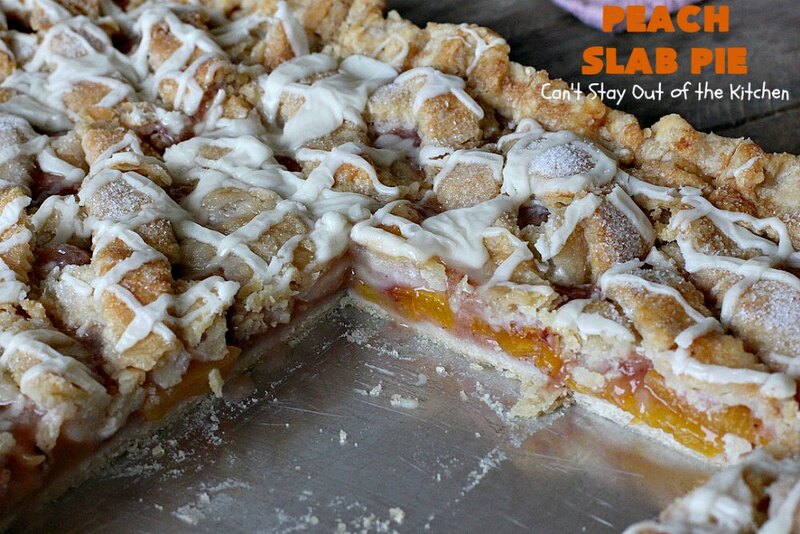 I made a lot of peach desserts, one of them being this wonderful Peach Slab Pie. I needed to use up a lot of peaches quickly, and this recipe seemed the best solution. I can’t tell you how happy I was with how this pie turned out. The peaches were cooked to perfection. I’m telling you, this dessert was so drool-worthy. Granted, Peach Slab Pie does take a long time to bake. However, if you’re not into making Homemade Pie Crust, you can save some time by purchasing pre-made pie crusts. You will probably need three individual crusts (or the equivalent rolled out) for the bottom. You will also need at least two individual crusts (or the equivalent rolled out) for the top. 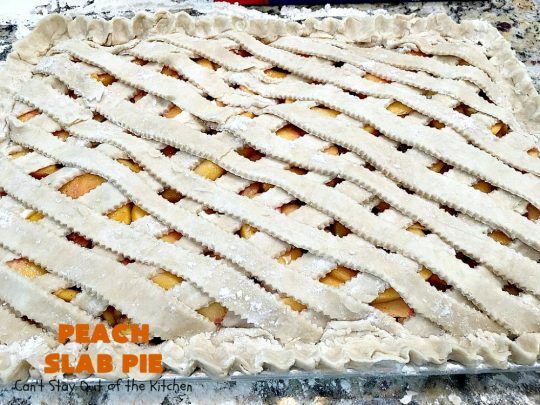 You may even need three crusts for the top, depending on how close you want to lay the lattice crust. Most people take the time to actually weave the crust. I NEVER do that, because I’m just too lazy. Sorry. But a weaved crust would certainly look more stunning. I have enough trouble staying out of sweet desserts anyway. I predict that if I hadn’t been making this one for the doctor’s office, I probably would have cleaned out almost all of it by myself. Yikes! 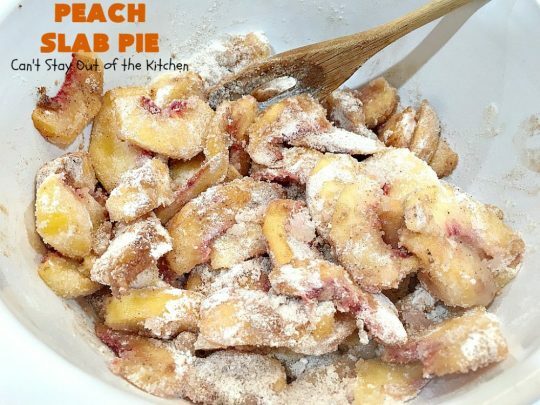 If you enjoy peach desserts and don’t mind a little work, this dessert is so worth the extra effort. This recipe will make a Peach Pie lover out of even the most finicky eater. And, you will find yourself seriously addicted to this amazing dessert. Enjoy. 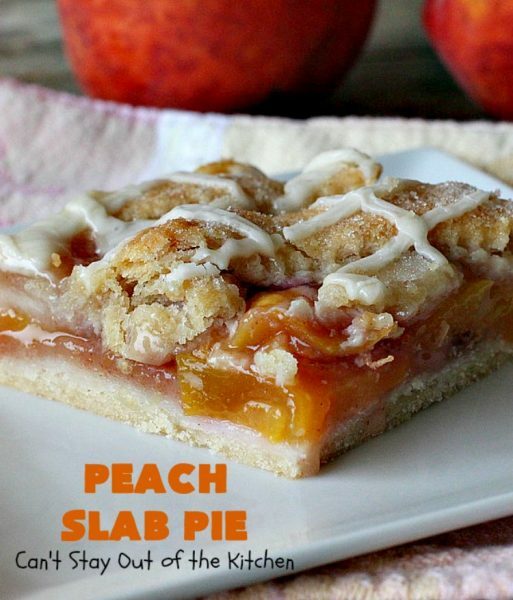 Peach Slab Pie is absolutely mouthwatering. 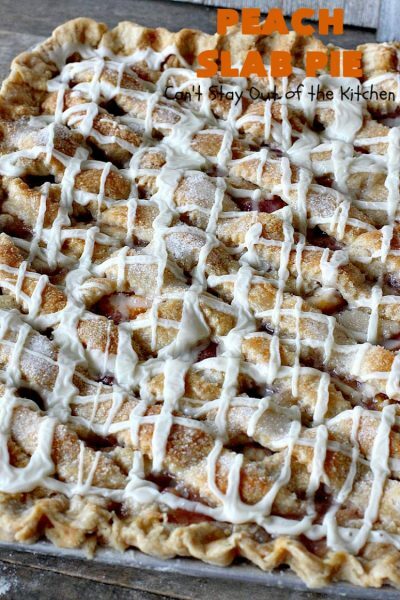 This is one of the most drool-worthy desserts ever! 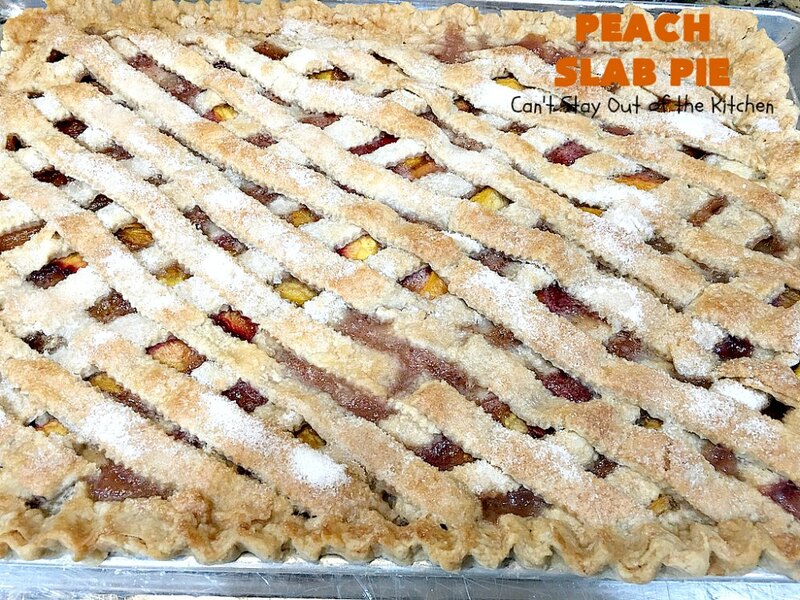 Everyone who sampled Peach Slab Pie loved it. This was one delicious pie. The nice thing about making a slab pie is you can pick it up with your hands to eat it. Yay! 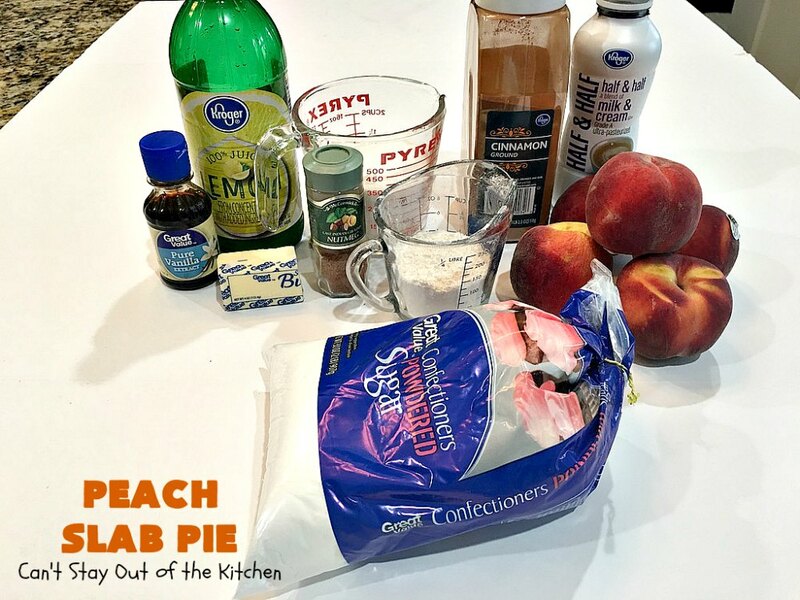 I used these ingredients, plus I used three batches of Homemade Pie Crust. 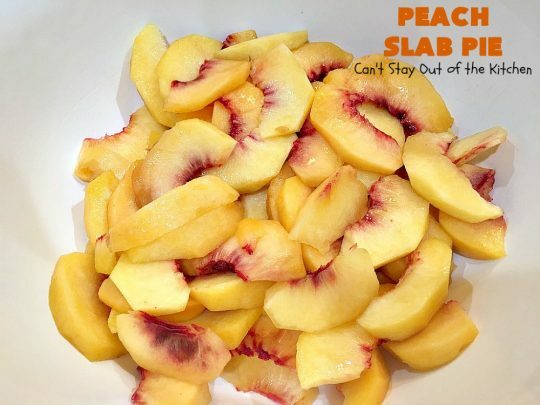 Peel and slice peaches and place in a large mixing bowl. Add flour, sugar, cinnamon, nutmeg and lemon juice. Allow the peaches to juice down while you roll out the crust. 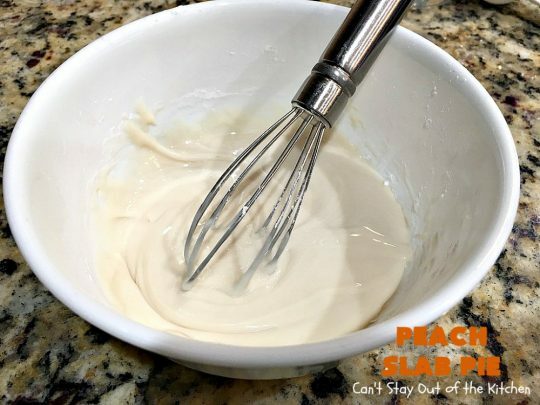 Grease a large 13×19″ cookie sheet. 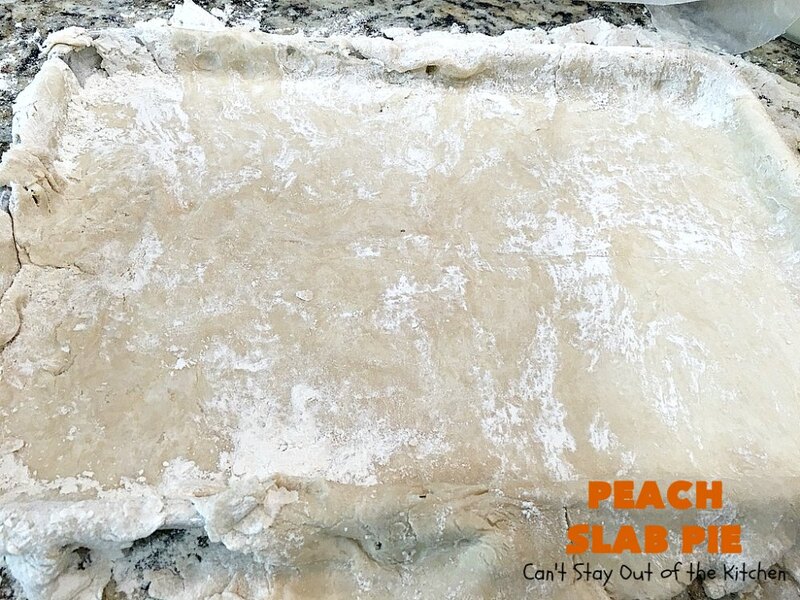 Roll out dough into a large rectangle large enough to fit the pan and overhang the edges. Now roll out the top crust. 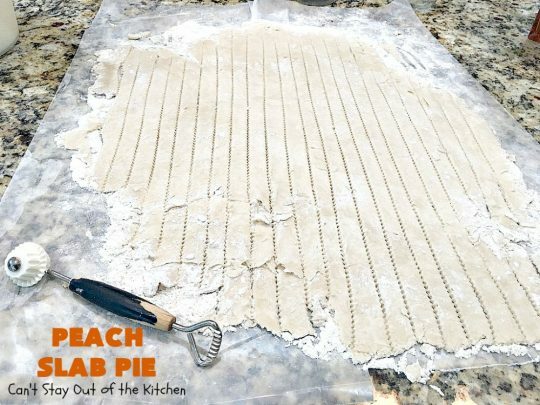 With a pastry wheel, cut the crust into strips. DO NOT FILL THE COOKIE SHEET WITH PEACHES UNTIL THIS IS DONE. Spread peaches evenly over crust. 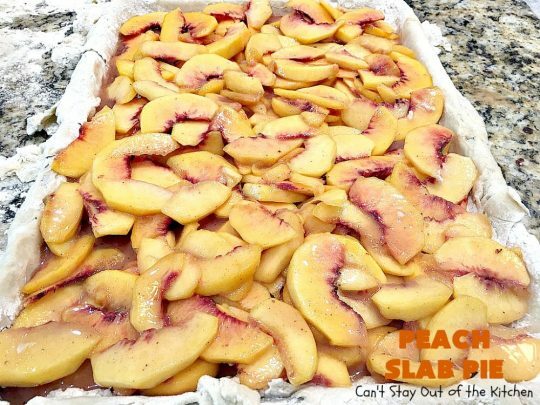 Try to spread all the sugar from the bowl evenly over the peaches so they get full coverage from the sugar. DO NOT add the peaches until the top lattice crust is rolled out and ready to go. Otherwise the crust will get really soggy. Dot the peaches with little dabs of butter. Spread the strips over top of the cookie sheet at a diagonal. Now spread the strips in the opposite direction. Flute the edges. 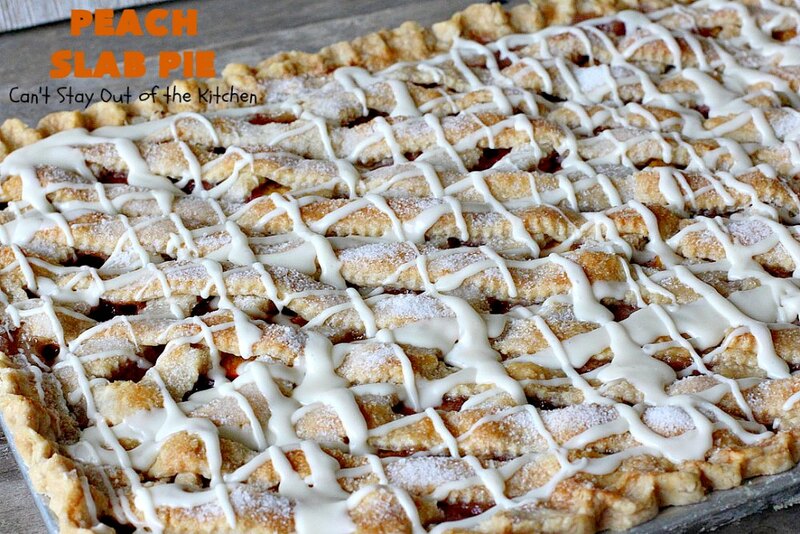 Brush milk on top of each of the lattice strips the best you can. (Some will drip off into the peaches. That’s okay). Sprinkle sugar over top of milk-brushed lattice crust. Bake at 400 degrees for 10 minutes. Reduce heat to 350. Bake an additional hour and fifteen minutes to an hour and forty minutes. The syrup from the peaches will be noticeably thickened and start bubbling up between the crust. It’s important that you not take the pie out prematurely. Otherwise, when you cut into it, the filling will be soupy. Mine took one hour 40 minutes to cook satisfactorily. If you feel like the crust is getting too dark, tent the pie with foil. Allow the pie to cool completely before adding icing. This may take an hour. Combine powdered sugar, vanilla and just enough half-and-half to make a thick icing. Once pie has cooled completely, drizzle icing over top of pie. (I did it horizontally and vertically to off-set the lattice crust). This is just the right amount of juicy. 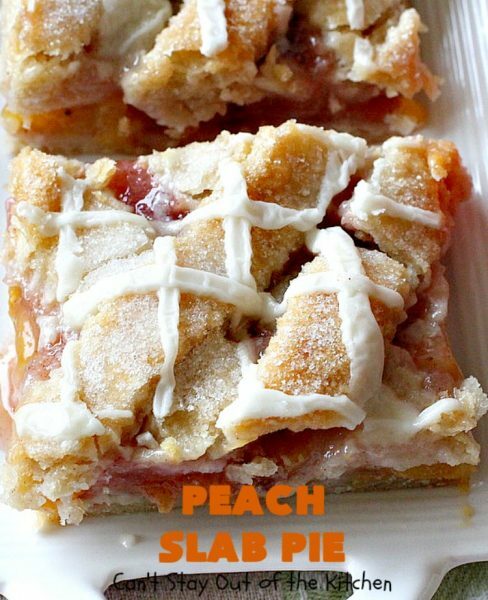 If you’re looking for a terrific dessert for tailgating parties, potlucks or backyard barbecues, this Peach Slab Pie is a winner. Are you ready for a sample? 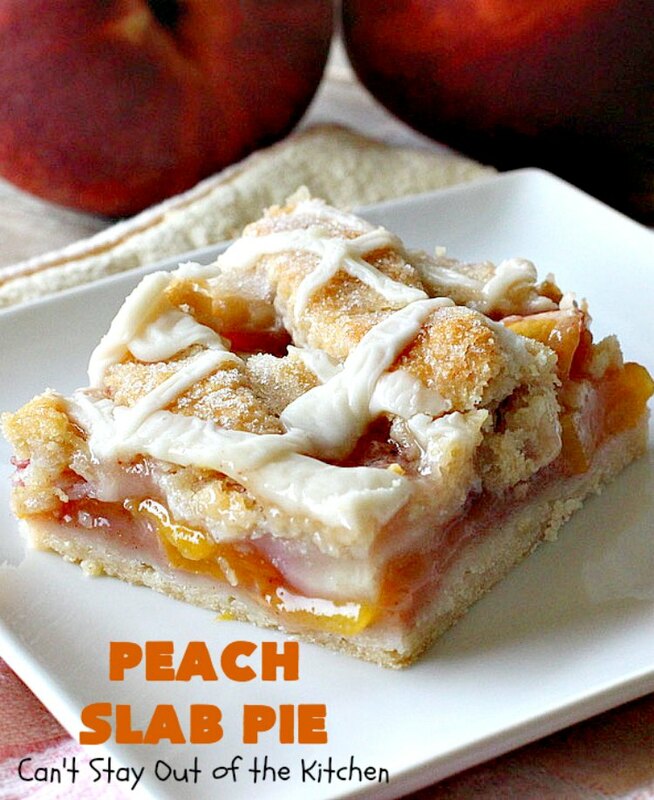 Peach Slab Pie is one of the most drool-worthy desserts you'll ever eat! This fantastic pie is filled with fresh peaches, cinnamon and nutmeg. A delectable powdered sugar icing is added on top that adds incredible flavor. 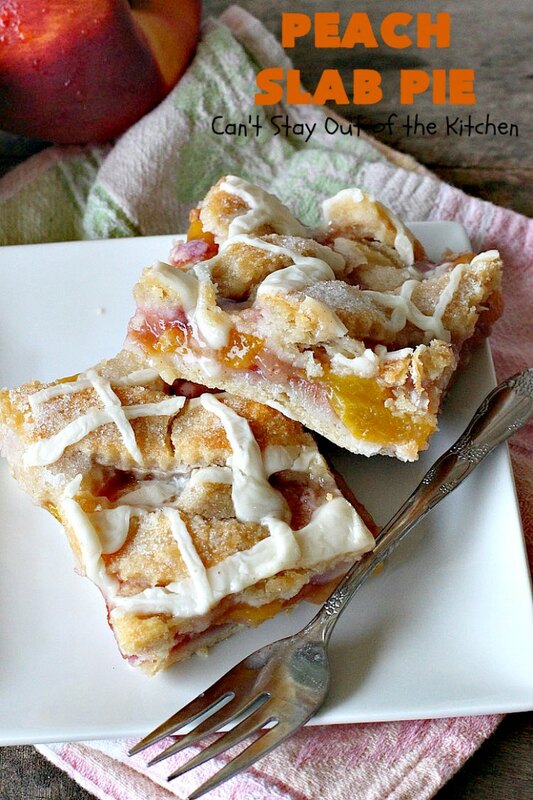 This slab pie is perfect for summer or fall baking when fresh peaches are in season. 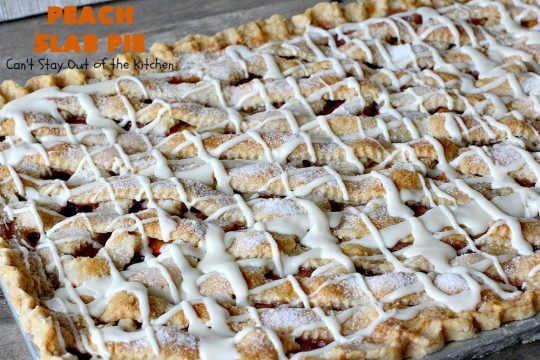 Everyone at your tailgating party, backyard barbecue or potluck will rave over this delectable dessert. Grease a large 13”x19” cookie sheet (with edges). Roll out half of the pastry to a rectangle that will fit and overlap the cookie sheet. Gently place pastry into greased cookie sheet. 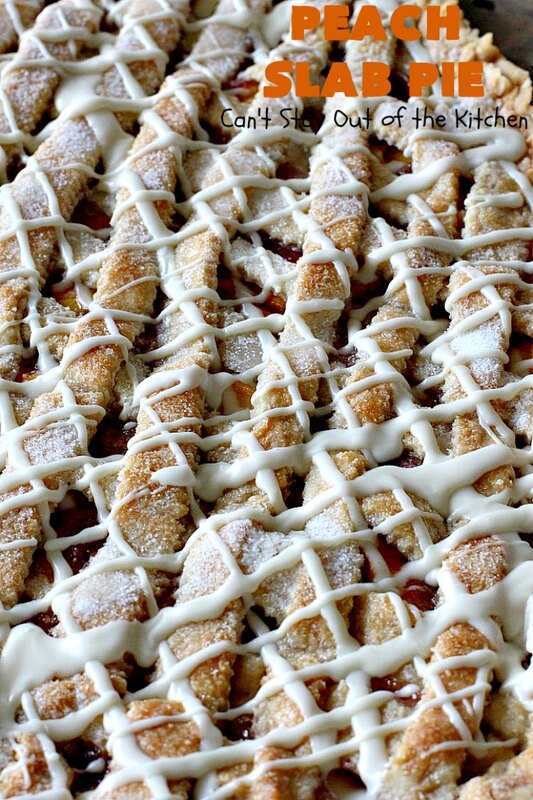 Roll out remaining pastry and cut in ½” strips with a pastry wheel. Stir peaches with 1 ½ cups sugar, flour, cinnamon, nutmeg and lemon juice. 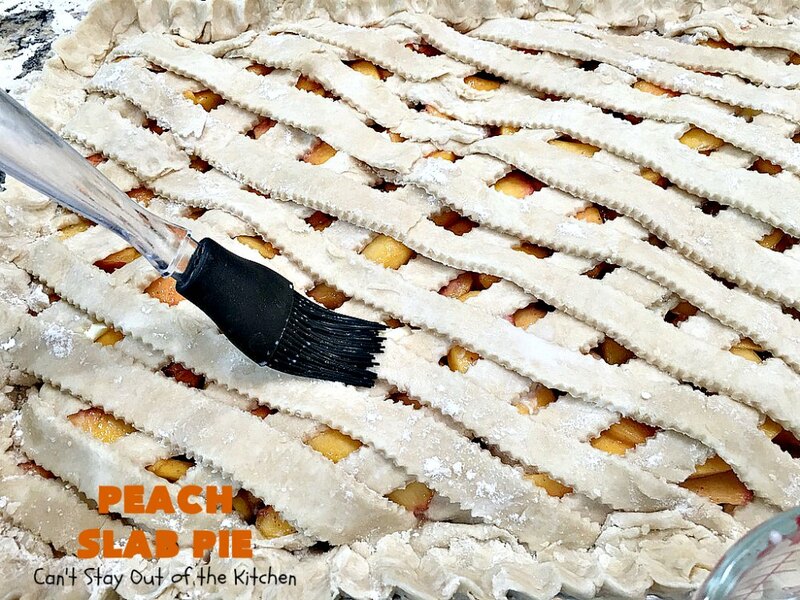 Arrange long strips of lattice crust in diagonals across the top of the peaches. Roll edges inward and then flute. Brush top crust with milk (1/4 cup or so) and then sprinkle with sugar (about 1/3 to ½ cup until well covered). 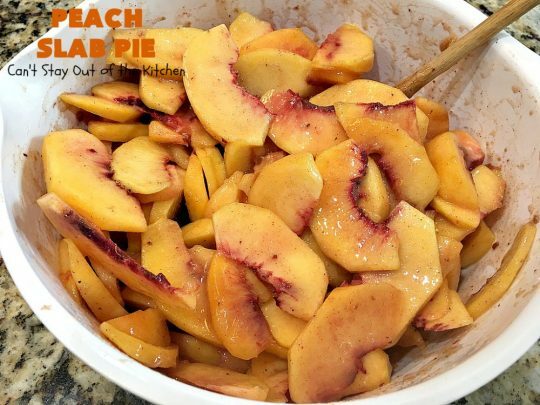 Reduce heat to 350° and bake for about 1 ½ hours or until peaches are fully cooked, syrup thickens and bubbles up thickly through the openings in the top crust. Combine ingredients to make a thick icing. 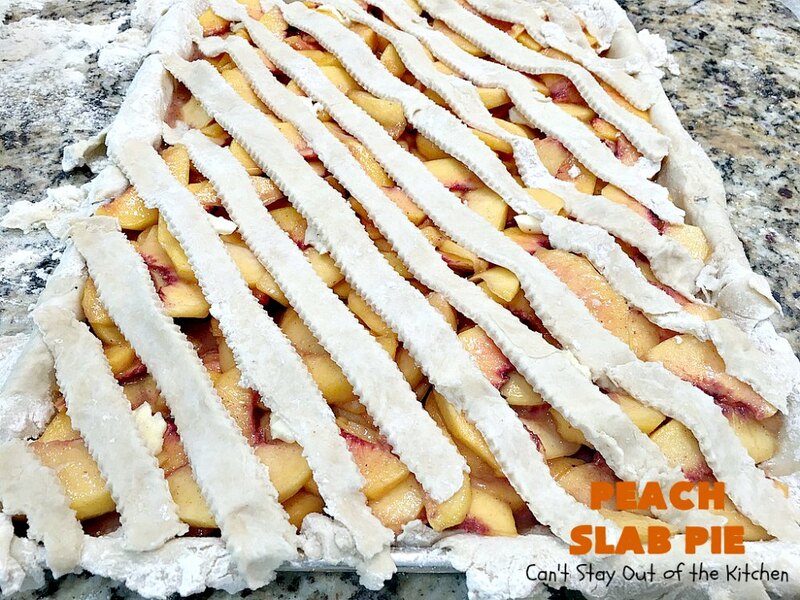 Drizzle over top of cooled Peach Slab Pie. Allow icing to set about 15 minutes before cutting into pieces. NOTE: My slab pie cooked 10 minutes at 400°, and 1 hour and 40 minutes at 350°, before it was set enough and syrup was thickened. 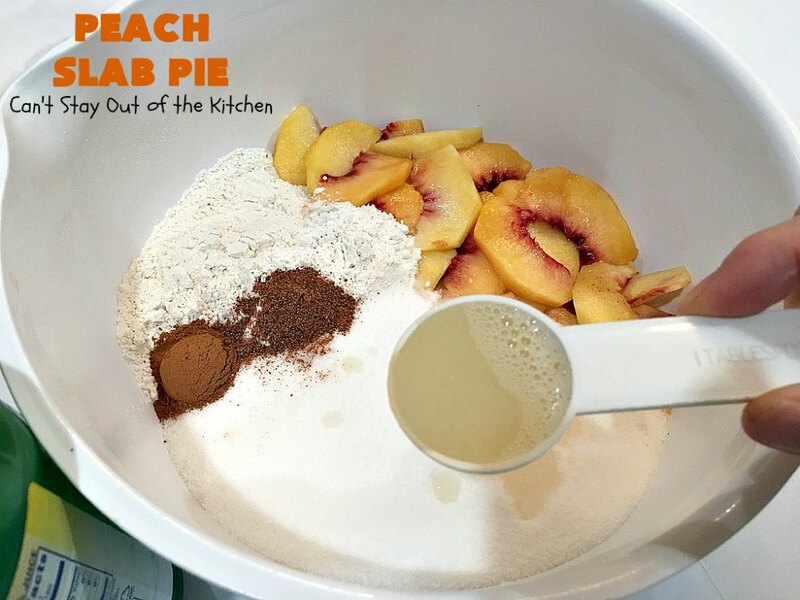 NOTE: Do not add the peaches to the bottom crust until you have the top crust ready to go. Otherwise, the peaches and juice will sit too long on the bottom crust and it will be soggy. NOTE: Preparation time can be decreased if using pre-made pie crust. NOTE: If pie crust appears to be getting too brown on top, tent with foil. 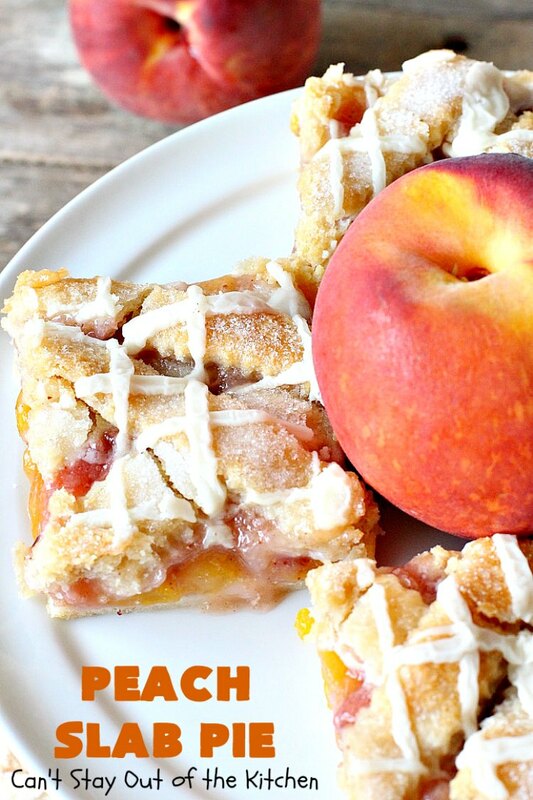 Peach Slab Pie is not only festive and beautiful, it’s mouthwatering and delicious, too. Peach Slab Pie will be calling your name after the first bite. You’re welcome, Patsey. Hope you enjoy it.